RW guest, Dudley Mairs, sent this photo in response to our recent post. After a gruelling 8-10 hour trek in the rain*, there suddenly appears the spectre of Daniel. 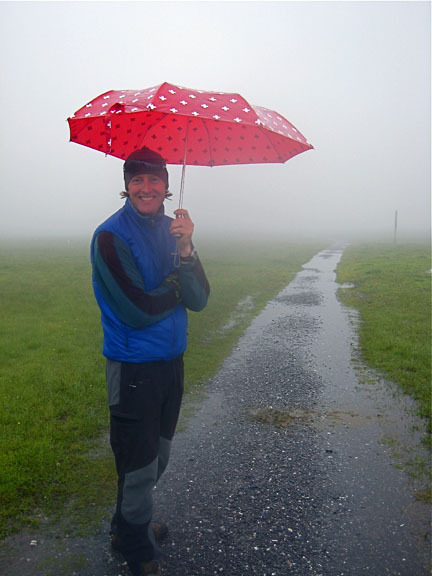 I must admit, I had Daniel’s umbrella in mind when I wrote about hiking with an umbrella. Sadly, I couldn’t find a photo of his umbrella anywhere. Fortunately, Dudley rose to the occasion. Thank you Dudley! You read my mind. Daniel once told me that he liked his umbrella because it reminded him of the loo at the Segantini Hut. See what he means by clicking here. Do you have your own umbrella photos, stories or tips? Please submit them. You can also post them on our facebook page. We’d love to hear from you. Two guys meet in the middle of the desert. One is carrying a car door, the other an umbrella. *Note. It doesn’t usually rain during our tours.